There is confusion about the Platonic Triad of higher Forms. Let’s clear this up. Often the Triad is given as Truth, Beauty, and Goodness. Because these are all Forms, it might be more technically accurate to refer here to the Form (meaning eternal essence or Ideal) of Truth, the Form of Beauty, and so on. But for simplicity, we simply say here Truth and not the Form of Truth, Beauty, and not its Form, etc. Within this formulation, naming the first two Truth and Beauty is fine, but calling the third Goodness is incorrect. The problem is that these three occupy only the second-highest tier in the realm of Platonic Forms. Above all three (and this is of central importance) is the Form of the Good. The very point is that by contemplation any of these second-tier forms (or all together), our minds are drawn upwards to contemplate or intuit the Form of the Good, or God. To call the third Form of the Triad “Goodness” therefore confounds levels. It places Goodness, or the Form of the Good on the second tier along with Truth and Beauty, yet also above Truth and Beauty. This is not only ambiguous, but contradicts what Plato actually wrote. The third Form of the Triad would be more properly called Moral Goodness. That is, it refers to the Goodness of the moral realm. Here ‘moral’ means something much greater than its colloquial use associated with ethical actions and choices; rather it encompasses everything that concerns meaning, value, and virtue in our life. Yet the term Moral Goodness is arguably not a prefect choice here. It might be misunderstood as suggesting that what it denotes has a greater or more direct connection to Goodness than Truth and Beauty. But such is not true; for we could as easily call the other two Truth Goodness and Beauty Goodness.The issue then is simply a limitation in vocabulary; we seem to lack a single word that means Moral Goodness. Now in truth we have such a word: Justice. So a faithful expression of the Platonic Triad could be Truth, Beauty, and Justice. However the word ‘justice’ in English carries certain connotations because of its other uses. For example, people today may associate justice with courts, laws, and retributive justice — associations which obscure the meaning of Justice here. What is meant in the present case is a Justice that is is inseparable from peace, harmony, moderation and right measure. Perhaps we could call it ‘just rightness,’ as in the sense of that special satisfaction felt when we get something just rightness. Therefore, with the qualification that one understands this fuller and nobler meaning of Justice, we can give the Platonic Triad as (the Forms of ) Truth, Beauty, and Justice (or Measure, or Virtue, or Excellence). 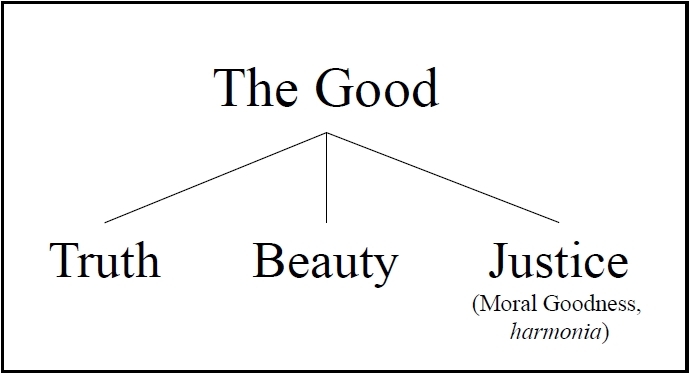 Plato describes three corresponding means of ascent to contemplation of the Form of the Good: i.e., via Truth (dialectical ascent in Book 7 of Republic), Beauty (Diotima’s Ladder of Love in the Symposium), and Moral Goodness (the Phaedrus Chariot Allegory). This Triad is not to be confused with the Neoplatonist “trinity” of the One, the Good, and Intellect or Mind (Nous). In the Neoplatonist model, as first described by Plotinus, the One is the ultimate level, from which proceed or emanate in a cascading sequence the Good, and then Intellect from the Good, then Soul from Intellect, then Body from Soul. Update: Plato seems to come as close as anywhere in his writings to explicitly stating this triad in Philebus 61a–66b, especially 64d–65a: Beauty, Truth, and Measure (metriotes) or Proportion (symmetria). In view of this new information I would be less eager to call the third member of the triad Moral Goodness, as that seems to specific. Principles like Measure, Justice/Justness/’Just right’-ness, Excellence, Proportion and Moderation all seem to apply. There is perhaps no single English term that expresses the essence of all these, which is perhaps what Plato means here. The Egyptians elevated this cosmic principle to the status of a goddess, Ma’at (Measure), who also corresponds to the Greek goddess Themis. Here’s how we put the Platonic Triad to practical use in our life. When, say, one is struck with the beauty of some beautiful thing, (or the virtue of some virtuous person or action, or truth of some truth), one lets ones mind rise to consider Beauty (or Moral Goodness, or Truth) itself: How all things deemed beautiful must share some common essence, Beauty; how this essence, Form, or Ideal of Beauty is something real; how it is changeless and eternal; how it is more perfectly beautiful than any actual object. For example, for any beautiful object, we see notice slight flaws or imperfections and can imagine how it could be still more beautiful. The perfect beauty towards which our mind inclines is the Form of Beauty, or Beauty. And then consider how Beauty itself is merely one species of Goodness. Truth and Justice are also good. So there must be some essence, Form, or Ideal which all have in common. This is the Form of the Good. Such considerations may enable the mind to rise, then, higher than Beauty itself, to glimpse with ones soul the Form of the Good. Adepts in the art of contemplation may then dwell on this sight, or rise still higher, learning more of the Form of the Good. And, it is said, a person’s mind can ascend still higher, beyond the Good — to the One beyond all differentiation. That brings us to the subject of so-called apophatic mysticism. This highest form of contemplation is called dark knowing, because it is beyond all concepts. But others of us who are not contemplative monks and deal with the practicalities of daily social life may, alternatively, draw from a glimpse of the Form of the Good the immediate intuition of what it implies for practical affairs. We may see a certain activity or task, for example, “in the light of” the Good; and this may help us to simplify problems, remove obstacles, pursue plans with much greater efficiency and effect, etc. Thus while some forms of the vision of the Good (the famous visio beatifica) are immensely profound and exceedingly rare, others are within our reach on a daily basis and can be of great value in ordering our practical affairs and lives. This is the goal of a good Platonic or Christian (or other religious) life. 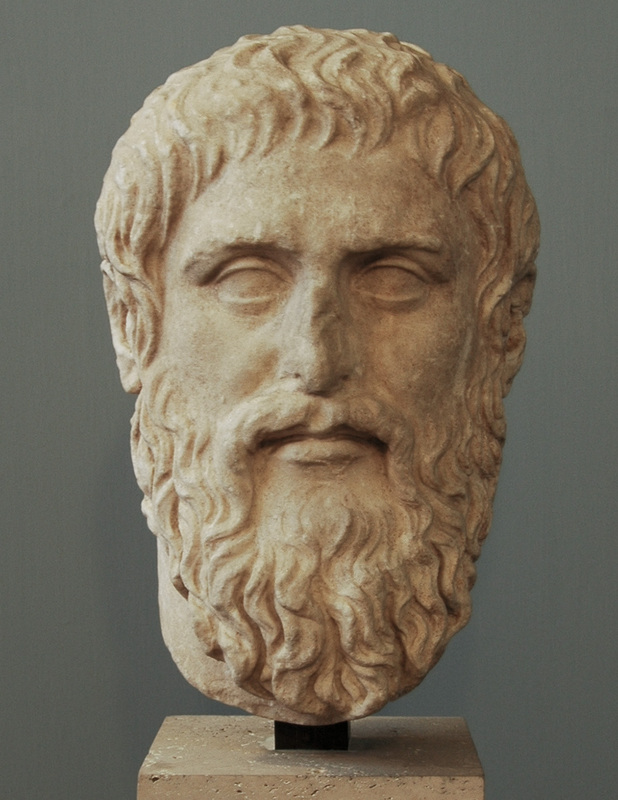 A personality built on this principle is the real meaning of Plato’s Republic: a city of soul where all the citizens — our numerous subpersonalities, passions, and dispositions — are ruled by love of Wisdom and love of the Good. Then our personality is a harmonious, integrated whole, and not an unruly mob of conflicting subpersonalities, each ruled by its own narrow desires and schemes. Plotinus. Enneads 1.3. On Dialectic. Trans. : Stephen MacKenna, London, 1917–1930 (4rd. ed. revised by B. S. Page, 1969). Summary of Plotinus, Enneads 1.3: On Dialectic, or the Upward Way.